The only thing that's surprising, as hundreds of revelations unfold on a daily basis, is just how precisely the pieces fit together, once the ideological precepts of globalism (as we now understand it) as the new age religion of the elite, is brought into play. 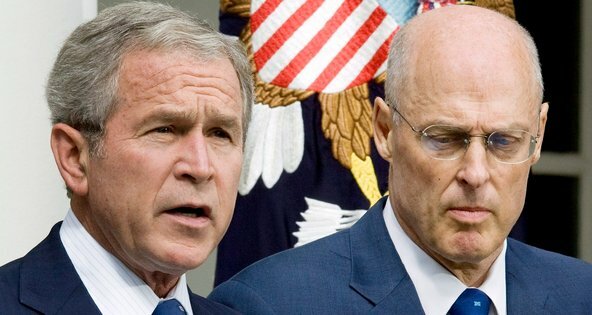 Hank Paulson, as you may recall, is the same operative who fell down on his knees begging for the politicos to approve his bailout plan for the banks In 2008...now he's trashing Trump and endorsing Hillary Clinton. When it comes to the presidency, I will not vote for Donald Trump. I will not cast a write-in vote. I’ll be voting for Hillary Clinton, with the hope that she can bring Americans together to do the things necessary to strengthen our economy, our environment and our place in the world. Paulson’s op-ed adopts the similar lecturing tone to what was called “Project Fear” in the UK, in which the Remain campaign recruited executives from multinational firms and establishment politicians to convince the victims of globalization that they had to remain in their current economic structure– or else. With Donald Trump as the presumptive presidential nominee, we are witnessing a populist hijacking of one of the United States’ great political parties. The GOP, in putting Trump at the top of the ticket, is endorsing a brand of populism rooted in ignorance, prejudice, fear and isolationism. This troubles me deeply as a Republican, but it troubles me even more as an American. Enough is enough. It’s time to put country before party and say it together: Never Trump.